in RPG history: Elmore's Basic Set cover. I like dragons, I really do. I like them to be powerful and terrible opponents with “human” weaknesses; this last characteristic is the reason why I find them superior to all other monsters. 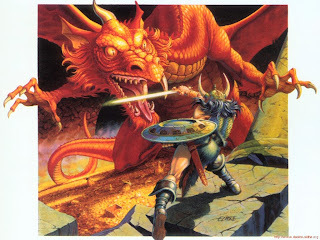 I played with delight the first seven or eight modules of the Dragonlance campaign, and every time I read The Hobbit I’m awed by Smaug and overjoyed at living again the wonderful adventures of Bilbo and his bearded companions. Good dragons are obviously an interesting element (I still find that part of Dragonlance a good one), but the REAL dragon must be evil. And it must be red. Ok: acid-spitting, lightning-spewing, gas-blowing dragons of different colours can be fun too, but no one of them beats the fiery breath of a red dragon, the incarnation of ruin, destruction and devastation. And maybe of vanity too!